With only six days until the window closes, we are now at the point where over £1billion has been spent on Premier League transfers. If you were wondering how Newcastle United were doing on Premier League transfer this summer…compared to the other 19 clubs, have a look at the table below. 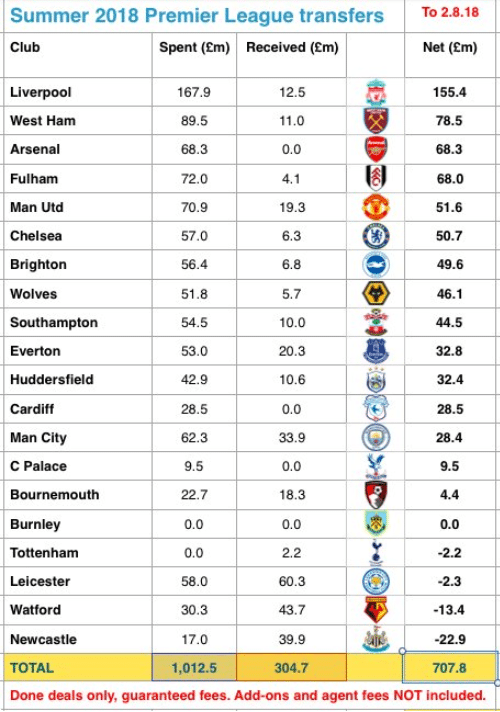 Sport finance experts Sporting Intelligence have produced a table showing how much every PL club has spent on players this summer and the total value of players sold. Subtracting sales from buys, they then also show the net spend for each club. If you are looking for Newcastle United, they are at the very top, or very bottom, depending on which way up you hold it. With Yoshinori Muto’s work permit having eventually gone through, the money spent total has ‘rocketed’ to £17m, according to Sporting Intelligence, but with £39.9m in sales, it means a negative net spend of minus £22.9m. However, just take a look at how stark the comparisons are with other Premier League clubs, West Ham a net spend of £78.5m and Fulham on £68m. The list goes on, Brighton (£49.6m) and Huddersfield (£32.4m) continuing to allow realistic ambitious investment in the team. An average now of over £50m spent by each of the 20 clubs and Newcastle are on £17m. As for sales, an average of just over £15m per club but Newcastle are at least performing ‘well’ on this one, more than two and a half times the average with £39.9m in sales. Even the media (well, most of them…) are now realising how poisonous Mike Ashley is for Newcastle United, especially in the ridiculous way he is undermining Rafa Benitez on transfers.